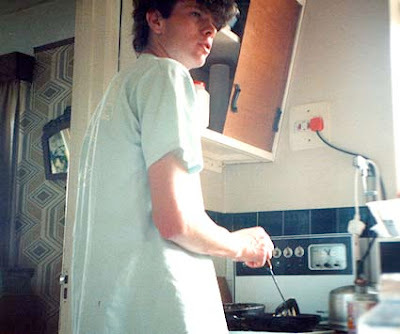 Back in 1987 I had a job at a company called; Tee Shirt Print. This was a cooler job then you might think as TSP was a bigger company then their one shop in Old Christchurch road, Bournemouth would suggest. In fact it was an international company with retail out lets all over the UK and manufacturing facilities in Egypt and China. 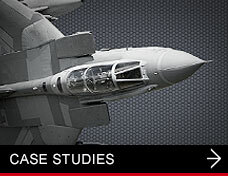 "Their own manufacturing facilities". 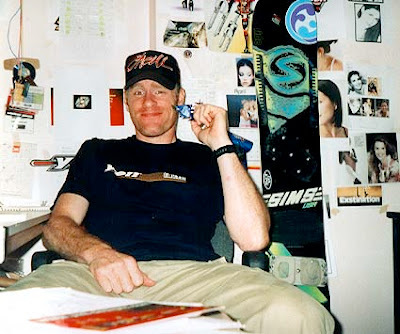 In his office, that looked like a 7 year old's bedroom, Neil practice some more colouring in. 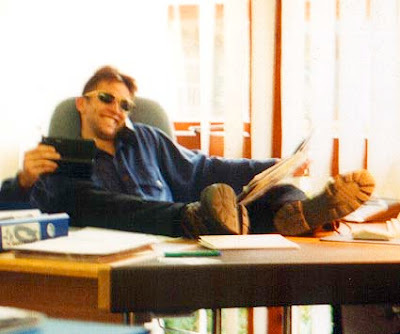 Hawthorn Offices 87ish. 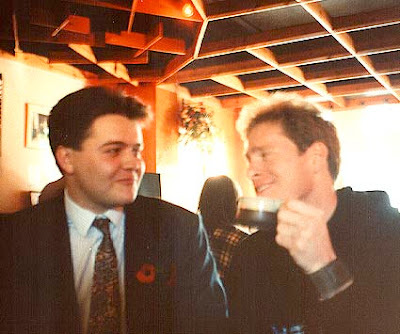 One day I was introduced to a guy called Adam Yeadon and this really was an introduction that would change my life for ever, although I would never tell Adam that! :) Adam needed to borrow our large repro camera and from then on he would come down to my studio, perhaps once a day to use it. 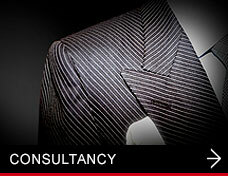 Anyway one thing lead to another and one day he asked me if I wanted to partner with him, to set up a new Bournemouth based design studio. Eventually I said agreed and Hawthorn Creative Design was borne. Adam at his work station with our one and only £7000 Mac. 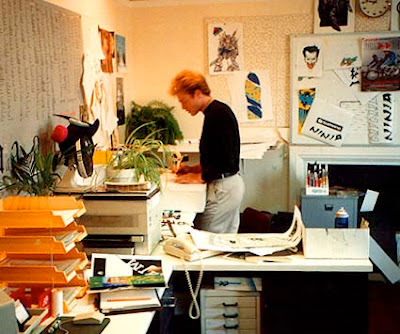 These were the days before the internet, we still did much of our artwork on drawing boards and I used to produce colour visuals using colour felt pens, Pantone pens that cost £3 or £4 even then. 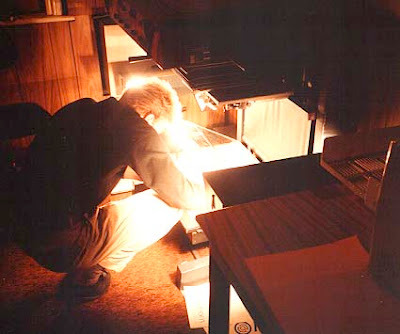 Faxes were still quite new and in the very early days, we used to go down to a bureau in town to send ours. 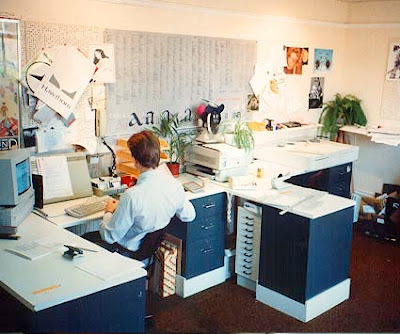 I can remember when colour photocopiers first came on the scene, My god this meant we could make colour copies of our visuals and send those to the client and keep the originals as a back up for if they lost or damaged it, which they bloody did, often, still the clients choice. 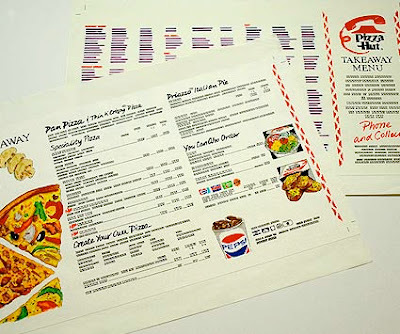 This is how your take Away menu would have looked in about 1998-99? 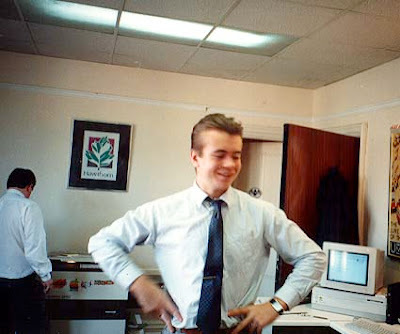 Sometimes in a lunch hour, Rick Astley would pop-in to show us his new dance routines. Norwegian Wood, looking good as it should, in it's fur lined hood. Every day for lunch or you just weren't cool. Norwegian Wood, Dom and I having a very bizo lunch time chat over a mediocre cup of coffee. 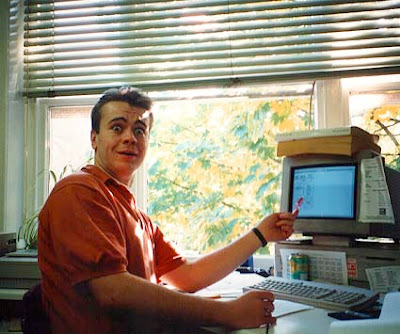 Is it me or does Dom look like a young Ricky Gervais? This is an Agfa repro camera for producing bromides, that we used in our artwork. 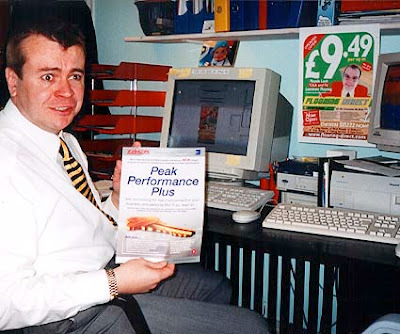 Adam told me on many occasions, that it was possible to get quite a nasty electric shock from a computer screen, he was always slow to take his own advice. Hawthorn sadly came to an end, in the property crash at the end of the 80's, for reasons beyond the scope of this post. 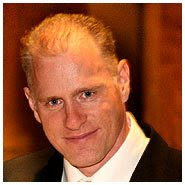 But again one thing lead to another and Adam found him self working at; Generic Marketing for Steve Gunnell, who used to be one of our clients in the old Hawthorn days. Pretty soon Adams brother; Dominic joined the team, closely followed by me and the four of us set about a little bit of creative empire building. 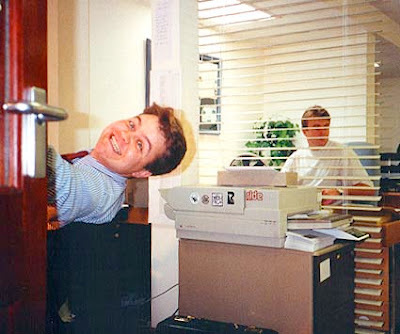 At Generic Marketing you were always greeted with a warm and sincere smile. Steve Gunnell master of all he surveyed. 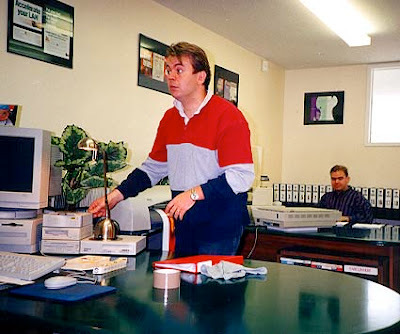 Steve was an interesting guy to work for but on the whole Generic was a very successful business and we all enjoyed working there but again, like all good things, in 1996 Steve had to radically restructure his company to survive. It was at this point, for a time we all went our separate ways and I established Neil Stevens Designs later to become Deshok.com. 28 days later? Shaun of the dead? there's no need to decide. 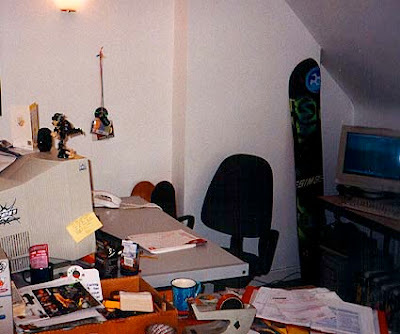 A tidy office is an efficient office. (Early Deshok days). "So this tidy office concept, can you explain it to me again"? I just don't seem to be able to get rid of Adam and Dom but of course, it might be the other way around, as we are all working in similar business now and our offices are on the same floor, in the same building. We have all known and worked with each other, almost every day for 21 years. One day I may look back and see just how special this relationship is but for now, I'm just taking it for granted :). 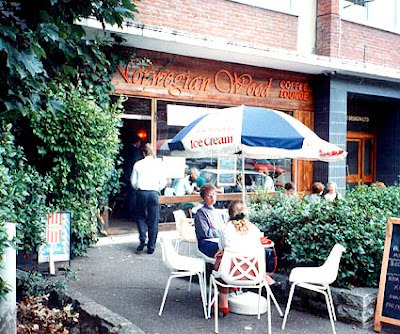 Steve's 99p, all you can eat, 70s decorated, fry up cafe was a very big hit. Weekend 1. and the dance floor for the new rave only night club was really coming together. We all invested £250 to buy wood, nails, screws, paint and so on, we ordered some ramp plans from Thrasher magazine and off we went. 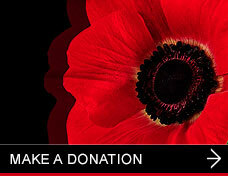 Some of us just put in money and helped with the build as and when passable. Some of us were there from start to finish. 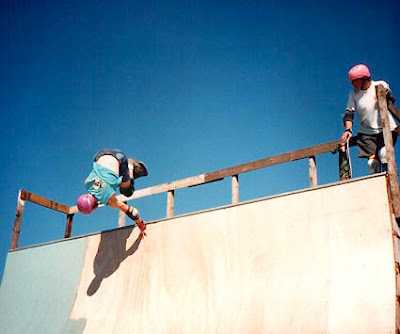 It was hard work with lots of blisters and splinter, I even stood on a nail but after about six weeks of solid building and lot of trips to the demolition yard for reclaimed timber there it stood our ramp, ready to skate. 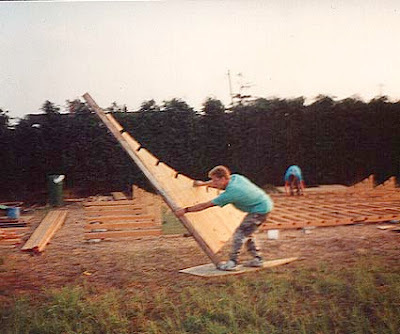 The concept for grass boarding was strong but there were problems with the plywood sail. 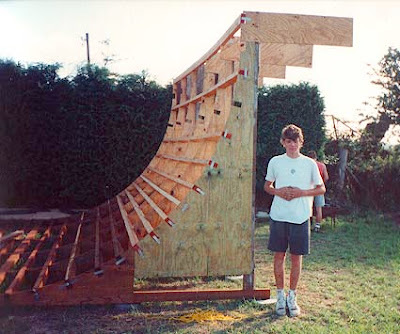 Giving the project some scale, Steve gave homage to the holy vert ramp. We told Richy that the ramp was finished. He was not happy. Sunday morning, about 930 after a full English breaky and a late night, early morning of clubbing. Not a good start but oh well "Dropping in"! This was a big ramp by most standers. It had 8ft transitions with 1ft of vert. The ramp was 20ft wide and the whole thing was 40ft from transition to transition. 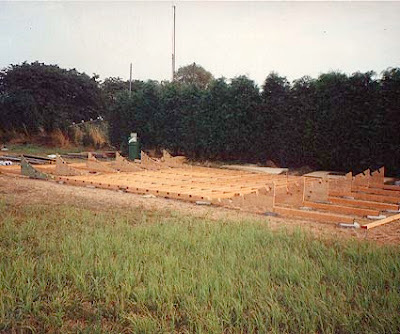 The neighbors wondered what we were building, we told them it was a church and they believed us, That's how big it was. 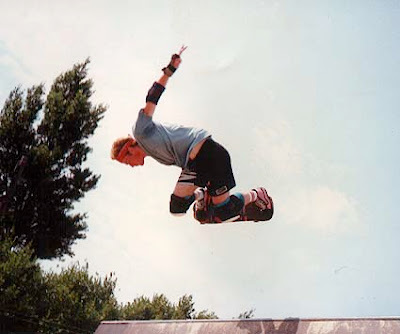 Steve front side air. This is early days. 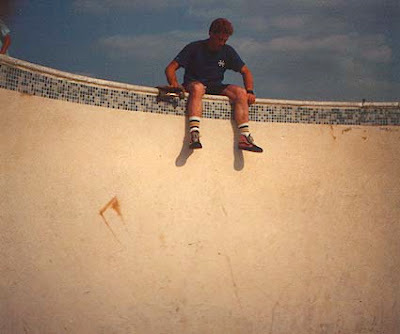 Steven used to grab after clinking off the coping. Very cool. Neil hand planting off the coping for the first time. this was a great feeling. HOW THE HELL ARE WE GOING TO RIDE THAT, IT'S MASSIVE! Now all we had to do was learn how to ride a ramp that big. 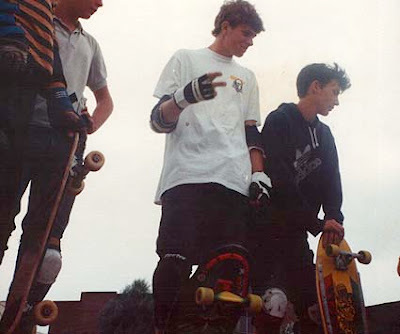 We had all ridden ramps before and some bigger but we were all real beginners but after a couple of excellent Sunday afternoon sessions, things started to fall into place. Friends from all over the country used to come down at weekends to ride it. We had BBQ parties magazines used to come down to do photo shoots. We even rode BMX on it. All very, very good fun. 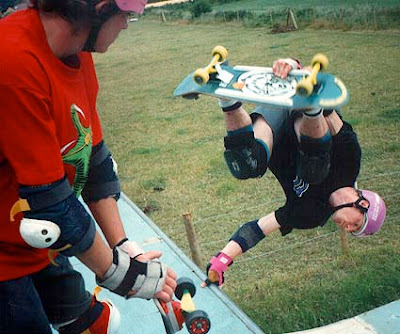 Gary and one of his patent pending front side grind. That's a barbed wire fence in the background. Health and safety was not what it could have been. Steve was only to pleased to show the French that he still had his bow fingers after the battle of Agincourt. We all remember the big storm in September 1987. 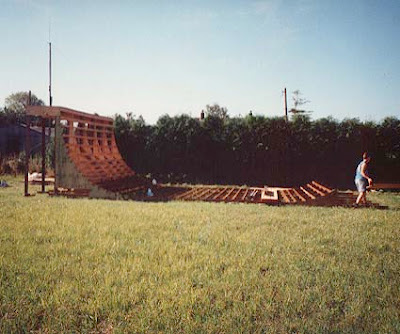 The one that the weather guy said wasn't coming and then blew all the trees down and caused all that damage, yea our ramp survived that only to be fully blown over in another big storm the year later. Our beloved ramp lay there with a broken back for a year I think, until one Saturday morning Gary's day arrived with a JCB to push it back on its feet again. It took us most of the summer to repair the old boy but now he was back and ready for more. 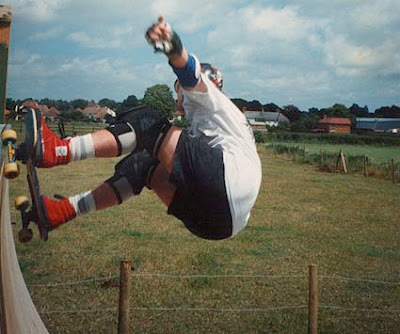 Front side air in the bowl at Slades Farm skate park. 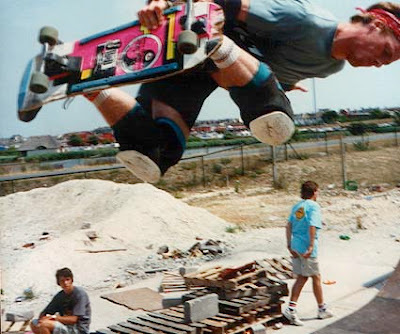 Back side air and funky 70s disco fashion sense at Weymouth mini ramp. The locals looked on, unimpressed. 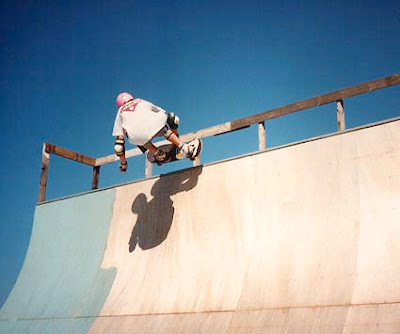 The Weymouth ramp was obviously the place for front side airs and sweaty pits then. Neil considered the pool and saw that it was dry. 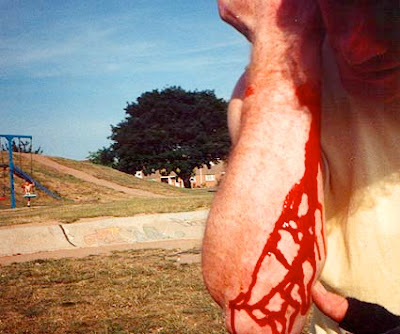 Romford skatepark. 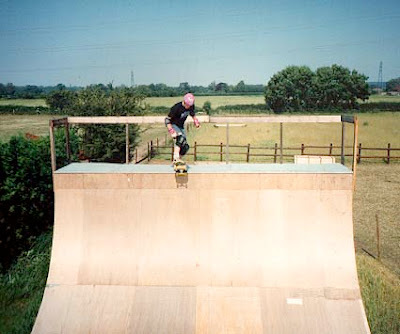 A friend, Adam, asked me "What ever happened to that ramp you had in your back garden"? In the end the ramp started to get a bit tatty, wholes started to appear and with every winter it would look a little more worse for wear. The were-for-all to fix it was all but gone now. Some of us had girl friends now and were doing other things so in the end, the old boy just rotted back into the ground. There is a compost heap and stinging nettles there now, an unfitting monument to some very cool skate sessions.